The nature of the contemporary global political economy and the significance of the current crisis are a matter of wide-ranging intellectual and political debate, which has contributed to a revival of interest in Marx’s critique of political economy. This book interrogates such a critique within the broader framework of the history of political economy, and offers a new appreciation of its contemporary relevance. A distinctive feature of this study is its use of the new historical critical edition of the writings of Marx and Engels (MEGA²), their partially unpublished notebooks in particular. The sheer volume of this material forces a renewed encounter with Marx. It demonstrates that the international sphere and non-European societies had an increasing importance in his research, which developed the scientific elements elaborated by Marx’s predecessors. This book questions widespread assumptions that the nation-state was the starting point for the analysis of development. It explores the international foundations of political economy, from mercantilism to Adam Smith and David Ricardo and to Hegel, and investigates how the understanding of the international political economy informs the interpretations of history to which it gave rise. The book then traces the developments of Marx’s critique of political economy from the early 1840s to Capital Volume 1 and shows that his deepening understanding of the laws of capitalist uneven and combined development allowed him to recognise the growth of a world working class. Marx’s work thus offers the necessary categories to develop an alternative to methodological nationalism and Eurocentrism grounded in a critique of political economy. This book is essential reading for anyone interested in the development of Marx’s thought and in the foundations of International Political Economy. Shortlisted for the Isaac and Tamara Deutscher Memorial Prize in 2015. A fresh and rich reading of capitalist modernity’s most important thinker. This book shows why those who dismiss Marx as ‘just another Eurocentric thinker’ are fundamentally mistaken. William K. Carroll, Professor of Sociology, University of Victoria, Canada. Contemporary globalization is an intensely contested process both intellectually and politically. In this important book Lucia Pradella traces the contradictory development of a non-Eurocentric understanding of the emerging capitalist world economy from the l6th century onwards. Her use of Marx’s unpublished notebooks, currently appearing in the new Marx-Engels Completed Works (MEGA2), helps to make this a study of exceptional value that throws new light of the construction of Capital. This is a timely and original book. 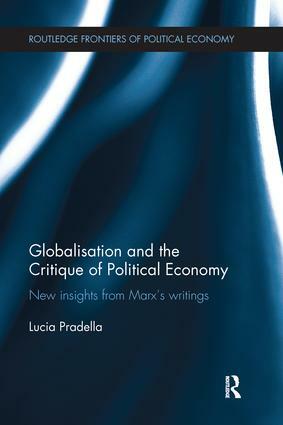 It draws on classical political economy using Marx’s recently published manuscripts to shed new light on his evolving approach to globalisation and internationalisation of capital, historical and contemporary debates on globalisation, and Eurocentrism and the role of the state. The greatest contribution [Globalization and the Critique of Political Economy] makes is in its use of Marx's study notebooks. Although, as Pradella rightly says, these provide no ground for erecting a "new Marx," her research helps to establish a richer understanding of Marx. Lucia Pradella is Post-Doctoral Research Fellow, University Ca’ Foscari Venice, Italy and Research Associate, SOAS, University of London, UK.